We have previously discussed video optimization by providing best practices and tips for video optimization. Heck we've even provided a list of video aggregator and related sites where you can submit video to. So we thought we would add to the video optimization tips and tricks by discussing how you can make use of Video Sitemaps. Earlier this week the Google Webmaster Tools blog introduced video sitemaps. In our effort to help users search all the world's public videos, the Google Video team joined the Sitemaps folks to introduce Video Sitemaps—an extension of the Sitemap Protocol that helps make your videos more searchable via Google Video Search. By submitting this video-specific Sitemap in addition to your standard Sitemap, you can specify all the video files on your site, along with relevant metadata. However video sitemaps can also consist of a sitemap-like page on your site that list videos that you host on your site or on aggregator sites such as YouTube or MetaCafe. Creating a video sitemap page on your site can be a great way to drive traffic to your videos that are available online. So how do you create a video sitemap? The first thing that you will need is an inventory of videos. Of course if you have hundreds of videos, you may be better off at simply promoting your own channel on YouTube, Yahoo Video or the like. However if you have a hand-full of videos that you host of your own site a video sitemap may be just what you need. Place Video Thumbnails on the Sitemap - that link to the actual pages that host your video. Similar to what ASK.com does when they show a video clip on a results page. 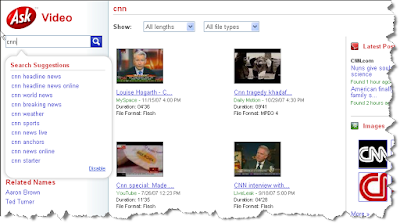 The screenshot here shows a search for "cnn" in ASK video. When you hover over the "thumbnail" the video actually plays. Setting up your video sitemap in a similar manner can entice more user engagement with the videos on your site and may help keep users on your site for a longer time thereby improving your site stickiness. Include a Well Optimized Title for the video thumbnail - this can double up as a text link to the video that features keyword rich anchor text. This can be a great way to improve your Inbound Linking Quality Score if the video is hosted on your own domain. Limit your Video Sitemap 6-10 videos per page - Depending on the size of your video clips you may want to add more providing the load time of your Video Sitemap page is not affected. With online video becoming as popular as it is, you might want to consider adding more video to your own site. The easiest way to organize and direct users to your video content could be through the use of a video sitemap. So while the video sitemaps that we mention here are different than Google Video Sitemaps, youcan see the value of implementing both.